Honestly, where has the summer gone?! No fiber within in me is ready to go back to school yet, but here we are. Summer I would have to say is my favorite season. I love the care-freeness of it all. There’s no need to sweat the small stuff because you’re already literally sweating buckets yourself. The long warm nights, days full of color, fruity drinks, beach trips, tans, vacations, adventures, and of course, opportunities to try something new. This summer for me was no exception. I’ve tried dozens of new products these past few months and discovered several new favorites to share with you today! So, here we go! NYX Soft Matte Lip Cream in San Paulo– This has been my go to neutral(ish) lip this summer! It is a lovely slightly warm medium pink shade that is long wearing on the lips without being too drying. It’s the perfect daytime shade! I last used this in my Summer Lookbook post. Pixi Natural Brow Duo– If you’re a regular reader, this will probably come as no surprise. This summer I switched from using the Sonia Kashuk Brow Archery tinted brow wax palette to this product. I’m obsessed! It’s the perfect everyday brow product because as the name suggests, it’s extremely natural looking! It easily shapes the brows and gives them the perfect amount of color without making them too dark. If you have black hair like me, but not jet black, this is the perfect pencil! It has the right amount of ashy gray tone without looking completely gray and is dark enough without looking like pure black Sharpie brows. Also it is the perfect product for travel as it has everything you need, all in one place! The shape of the pencil end is also nice because it is permanently slanted and doesn’t need any sharpening, another travel bonus. NARS Laguna Bronzer– This is an oldie but a goodie, and practically screams summer. I’ve re-fallen in love. This bronzer is the perfect universal shade for most skin tones light to medium-dark and isn’t too orangey or have too many gray undertones like a contour powder. It adds a nice shadow to the hollows of the cheeks while also adding warmth and glow to the face. 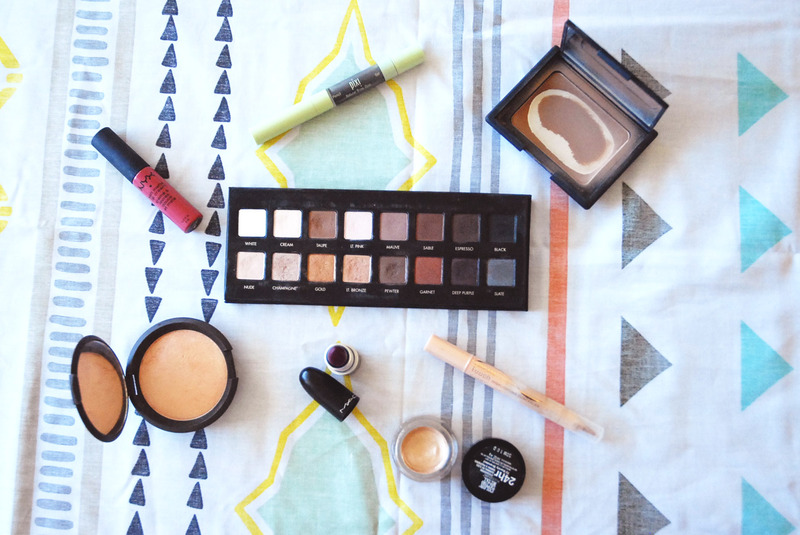 I love using this for a one-stop-shop to contour and bronze with. Lorac Pro Palette– If you follow me on Instagram, you’ll know I’ve been reaching for this palette non-stop in all my FOTD posts. It’s a great neutral palette for everyday and also for travel. It has the perfect range of light to darks, with the exception of no medium flesh tone blending shade. Also it is half matte, and half shimmery shades so here is a nice balance. It is mostly warm tones and smokey neutrals, which typically isn’t my thing, but I’ve been loving it this summer! The color and formula selection also make it great for travel and the packaging is lightweight. However, the packaging is not my favorite as it is very delicate and the mirror is very cheap quality. Nonetheless, the shadows are amazing quality. Jaclyn Hill x Becca Cosmetics Shimmering Skin Perfecter in Champagne Pop– If you follow me on Instagram, you’ll also know that this has been in several of my FOTD posts. I’m obsessed. This stuff is great! I’ve only recently dipped my toes into the highlighter world, and this product makes a great addition to a small collection. It gives a wonderfully glowy, golden sheen and is suitable for almost all skin types. It is neither too frosty that it would look ashy on (most) dark tones and also isn’t too dark that it wouldn’t act as a highlighter on light skin tones. The color is also very universally flattering, neither too warm or cool. This really is the perfect balance. However, I will say that I agree with Bows and Pleats, that this is not an extraordinarily unique in color, but is worthy for it’s creamy and smooth formulation and versatility. It really does give that #highloghtonfleek Jaclyn Hill glow and pays off well. I haven’t been able to put it down! MAC Rebel Lipstick– Also a frequent product on my Instagram, I love this berry color for an everyday, wearable grungey look. It’s vampy without being too dark, and on the lips appears as a bright, boysenberry shade. It is a Satin finish, so it still is very summer appropriate as it isn’t very matte and intense. Maybelline Color Tattoo in Barely Branded– This has appeared in a tutorial or two in the past, but this is the perfect everyday lid color to add just a bit of shimmer to the eyes on a lazy day. During the summer I tend to wear a minimal amount of makeup on an everyday basis and this product has been in my rotation. It acts as a nice base and color for a single color of shadow over the lid. Maybelline Dream Lumi Touch Highlighting Concealer– This is another one of my everyday lazy staples. If I’m wearing absolutely no eye makeup, I’ll just quickly run this some of this over my lids along with under my eyes on on my highlight points to give an everyday “strobing” effect. It doesn’t provide much coverage, but it makes highlighting a breeze. Normally, I don’t have a brushes category as I usually do not have enough brushes to talk about or I just lump them in with the makeup category. However, the makeup category was getting especially long so I decided to make a small sub-category of sorts to keep things cleaner. Morphe M501– This brush came highly endorsed by Jaclyn Hill so I of course had to have it. And at around $6, how could I resist? 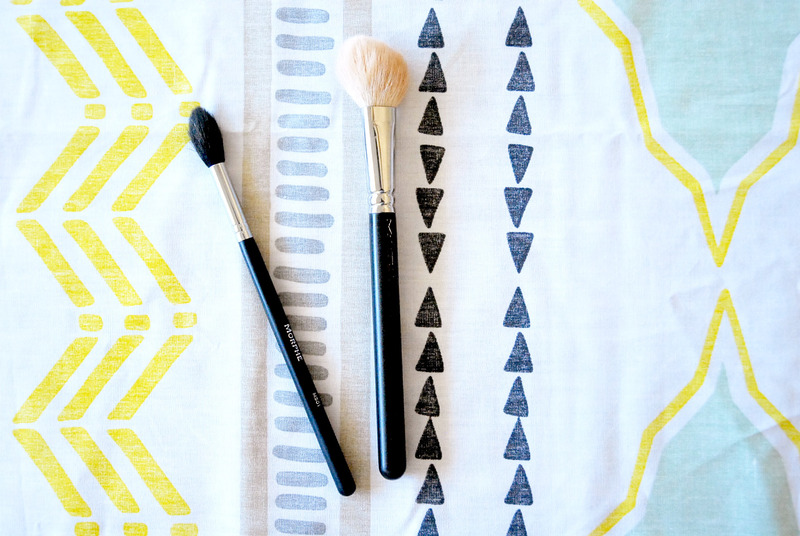 This brush pairs phenomenally well with Champagne Pop and they are a match made in heaven! It is super well made and the sable bristles are high quality, not to mention extremely soft. The size is neither too long or wide and is the perfect shape for running over the length of the cheek bones. It is almost always sold out, so get your hands on it when you can! MAC 168– I’ve fallen back in love with the brush paired with Laguna. The combo makes the bronzing and contouring step a breeze as it is compact enough to fit in the hollow of the cheek bone, but still fluffy enough that it blends product and doesn’t leave any harsh edges. In general, my whole skincare routine is my favorite as it has been doing wonders for my skin! It even includes two products from the last favorites post. To spare you from this post becoming any longer, I’ll just refer you to my last post which focused on my skincare routine in it’s entirety! If you are interested in this Michael Todd cleanser, click here to receive 20% off your entire purchase! Sally Hansen Airbrush Legs– This product was featured in my first sponsored post with Influenster, but it has quickly become one of my favorites! It’s the perfect alternative to spray tanning or self tanning, as both can become somewhat of a chore. If I just need a little pick-me-up this does the trick by evening out the complexion of my legs and giving them the perfect amount of color. To see this baby in action, see here. 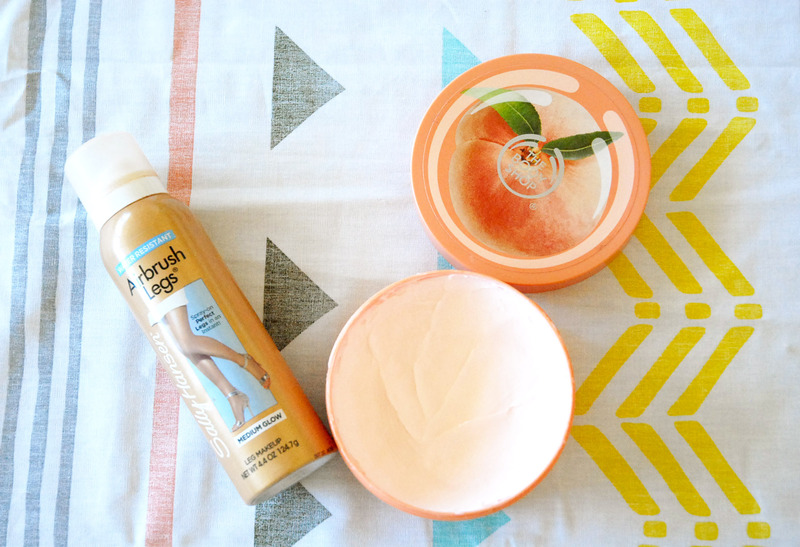 The Body Shop Vineyard Peach Body Butter– I hauled this product in this post here and have since been loving it. I tend to love all Body Shop body butters, as they are the perfect consistency. They are not too heavy that they need to be tediously worked into the skin and not too light that they don’t provide any moisture; they’re simply just right. And you can’t go wrong with the scent either! Like I’ve mentioned before, The Body Shop does an excellent job of making fragrant, but not overwhelming scents, and this is no exception. It smells of a true peach with mostly fruity notes and some slight floral to it, making it a pleasant scent and not cloyingly sweet or artificial smelling. I heard a rumor that this scent is going to be discontinued, so if you are interested, you should pick it up when you can! Pro tip: it is on sale right now for half off. Up until recently, when I got a haircut, my hair was being rather difficult. I’m in the process of growing it out so it is rather difficult to maintain, especially since it gets so thick quickly. In order to tame my locks, I developed this hair styling routine. 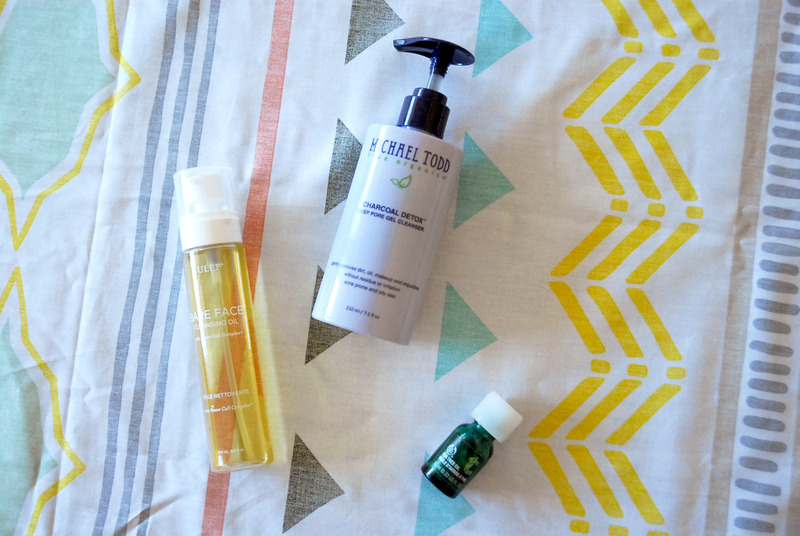 Typically, I’m not one to focus much on my hair, but these products make it effortless! 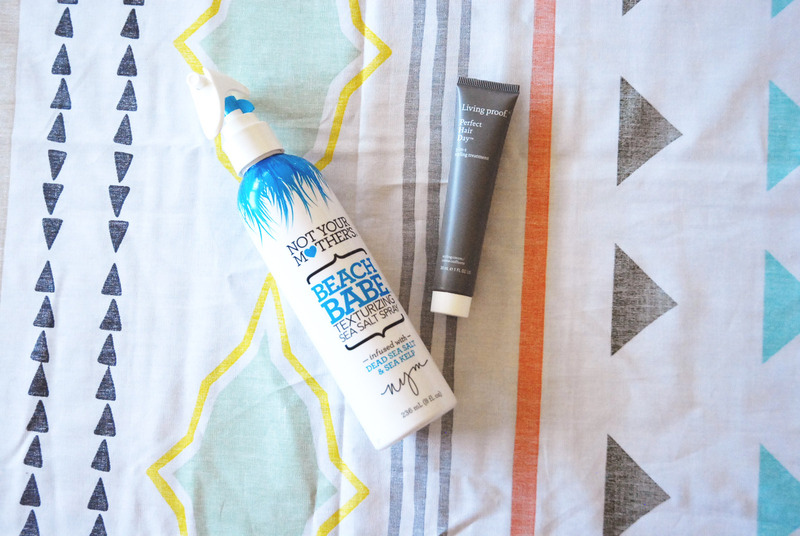 Not Your Mother’s Beach Babe Texturizing Sea Salt Spray– This stuff is great! I’ve tried other sea salt sprays where they’ve dried out your hair or literally left your hair in the grimey, matted condition that comes with splashing in ocean waves all day, which is not a pretty look. This on the other hand, provides wonderful texture without sacrificing moisture. I apply this to damp hair to make pretty, effortless waves! Living Proof Perfect Hair Day 5 in1 Styling Treatment– I got this deluxe sample in a with purchase set from Ulta and I’m so glad I got to try this! It is a wonderful size that allows you to try a product and actually have enough uses to form an opinion. It also is a good size for travel! Despite it being small, I have gotten a good amount of uses, though. You only need the smallest amount to run through the ends of your hair. I also apply this to damp hair before either blow drying or French Braiding overnight to create even more defined waves without even trying! The results are soft, smooth, and silky hair. It also has as a wonderful floral fragrance that fades after application. 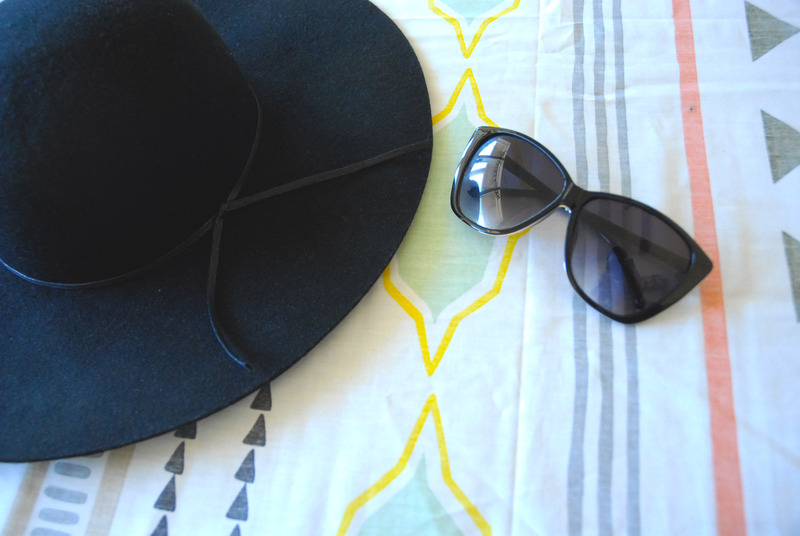 Nordstrom BP Rope Trim Floppy Felt Hat– This hat has been seen in a few recent posts, and my Insta feed as well. I love this accessory! It gives that boho, relaxed vibe without being too hippie. The felt is a nice material, but still lightweight enough that it doesn’t trap too much heat on your head. It also provides good protection from the sun on your face, neck, shoulders, scalp, and back. Plastictail Oversized Butterfly Sunglasses– This have also frequented my Insta feed, as well as even shown up in my last favorites post, although then they weren’t yet favorites. Since then, I’ve been reaching for these on an almost everyday basis. They are the perfect combination of both vintage yet glamorous. The subtle cat eye shape gives it a vintage inspired feel, but the oversized size keeps them grounded in the 21st century. Also, the gold detailing adds more modernity and sophistication to their style. VSCO Cam App– I’ve wanted this app for a while now but I’ve never had enough memory on my phone to download it. I finally got a phone upgrade in May and was able to put this app to work! The editing tools are very useful, especially the skin tone color balancing one, which I’ve found to be unique to the app. I also love the filters! You do have to purchase some, but there are a few free ones. My favorite free filter is C1. It gives a lovely saturated look, with rich teal blue toned shadows, but still maintains enough contrast so that the lights aren’t too muddy looking. I’ve been using this filter on plenty of my Instagram pictures! Fujifilm Instax Mini 8 Polaroid Camera– I know that every beauty guru and Youtuber has one of these, but I’ve wanted one before they even became Tumblr famous. I finally felt it was the right time to splurge since summer is when I take the most trips, and hence pictures. I’ve already burned through almost 3 sets of film! I also finally found it in my signature color, an aqua turquoise mint shade, so it felt like a sign to finally invest in one! I love having physical copies of memories, because sometimes you never know with digital files. In this day and age, files can sometimes just disappear! There’s nothing else like having a solid picture in your hands; it’s an art that I hope never dies. 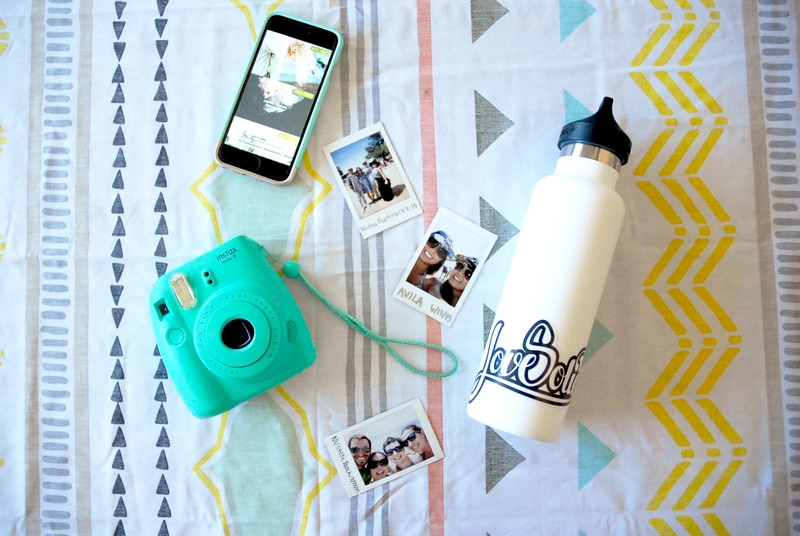 HydroFlask– This has been a relatively new purchase, but my sister has one that I’ve been jelly of for a while. This is no ordinary water bottle, but is a godsend! It is a double paned flask that keeps your liquids at the practically the same temperature that they were to begin with. Water and beverages remain ice cold and hot drinks are still steaming. Once, I left my HydroFlask in the car for an hour in 100 degree weather, and when I came back my water was as cool and refreshing as it was when I poured it! It’s the best, although I’ll admit a bit pricey at around $25; however, I find it extremely worth it. I found mine at Sports Authority which seems to consistently have coupons online, if you’re willing to search for them. If you’re anything like me, I need to stay consistently hydrated, especially during the summer and this makes it extremely easy. However, if you are prone to losing things, I would not suggest this as it is a bit of an investment to make, but it also does cut down on unnecessary plastic bottles. I also use the app Plant Nanny (another recommendation from my sister) to track my water intake and remind me to stay hydrated! The app figures out the proper amount of water you should be drinking based on weight and activity levels and then sends you reminders throughout the day to drink your allotted amount. Each time you finish a glass, you log it and it gives water to your little pet plant friend. If you don’t water yourself, you don’t water your plant and it will eventually die, making you emotionally obligated to keep your buddy alive, and encourage healthy habits. You can choose from many different plants, and even name them, put them in different pots, and change the background! It’s a fun way to make a boring task less boring! The sticker on this bottle is actually from the clothing company Love Solid, a Bay Area based Island inspired clothing co! My cousin works with them, and they have some pretty cool gear that I’ve sported before on my Instagram, so be sure to check them out if you’re into relaxed lifestyle or street style! Pressed Juicery– Not pictured, but if you have been keeping up with my Instagram, you’ll know I’ve been frequenting Pressed Juicery. Their cold pressed juices are the perfect pick me up and I love them for breakfast or post work out. I’ll admit I’ve been having them pretty frequently because their shop is right across from my yoga studio. Favorite Movie- Usually I do a TV show, but recently I’ve been giving into my guilty pleasures and watching random things like cartoons and anything on HGTV or Food Network. Also American Pickers. I love American Pickers. Anyhow, none of them have really been “favorites”. Instead, I really loved the movie Paper Towns! I read the book and really enjoyed it, but watching it on the big screen really brought it to life. The movie kept the playfulness of the book while adding a bit more character depth and staying true to the events of the original plot. The casting choices I thought were good fits, even Cara Delevingne who I did have some apprehensions about at first. However, her character is so fleeting and the actual presence of her is so unimportant, unlike the idea of her which is exactly what the book was about, so I found Cara was a great fit. Also, John Green is a phenomenal human, enough said. Favorite Blog- Christina Bee x3 has a great blog with honest reviews! 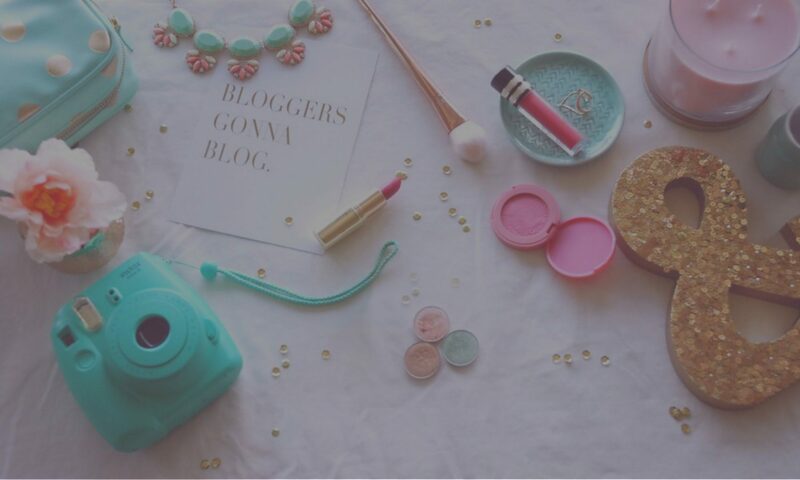 She also turned me onto working with Influenster! She always leaves me the sweetest comments on my posts which always seem to make my day. If you’re not already following her, why? It's so hard to leave this bed 😭😍 Lips: @anastasiabeverlyhills Veronica liquid lipstick Eyes: @makeupgeekcosmetics beaches and cream, mocha, and in the spot light Lashes: @houseoflashes boudoir 🙂 Brushes used: @morphebrushes as always! Code MANNYMUA for 10% off! Favorite Moments- I’ve loved travelling this summer. As you saw in a previous post, I went to Disneyland earlier this summer, but that was about the only large vacation I took this summer. 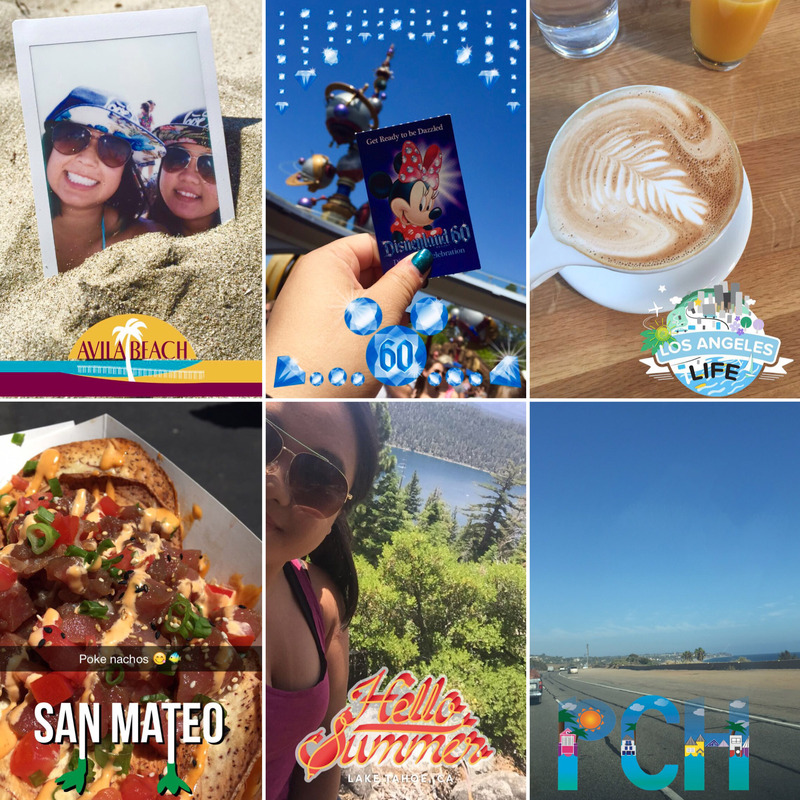 For the most part, I did a lot of small weekend trips to Tahoe or the Bay Area or even LA and staycation type activities in-between. Travelling is my favorite and I love seeing different surroundings and having different experiences. Another favorite moment I had this summer was reaching a new personal best in page views in a single day. I know that the following number may not be impressive, but quantity has never been my goal, and instead my focus has been on quality. However, this is moment has signified growth for me and my blog, so I do reflect on it fondly. As of August 2, 2015 the most pages views I’ve had in one day is 113. I hope to only continue to grow from here. Thanks to all my readers to getting me here thus far! That about wraps up this favorites! If you’re still reading, thank you so much! I’ll catch you soon. Leave me a comment telling me what your favorites were this summer!